Ensure that you know exactly which floorboard is loose and causing the squeaky noise. You or someone else can walk around the floor to identify which floorboard is causing the trouble. If the floorboard has not been damaged, then you may be able to re-nail it and continue on with your day. If the floorboard seems to have some form of damage, then we advise that you use pincers to remove the nail and a claw hammer to remove the board from the floor. Get yourself a new floorboard to replace the one that you have just removed. 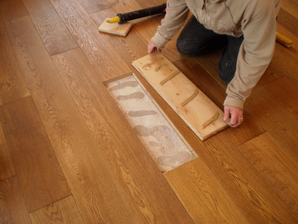 Drills holes near to the edges of the new board and place the floorboard in the space in the floor. Now, you can place screws in each of the holes and screw them in snugly, until the screw’s head goes a little lower than the surface of the floorboard. Test it out and if you find that you still hear a little squeak, then you should try sprinkling some talk or washing powder into the joint and use a knife to get it worked in. This will kind of act like a cushion and stop the squeaking noise from happening. We are professional flooring contractors in Ottawa. If you are looking to replace your floors in Ottawa or refinish your floors in your home to look like new again then give us a call for a free Ottawa flooring quote. We have the experience needed to make recommendations on the right materials for your flooring job and we can do the flooring work the right way to ensure your Ottawa floors last for a long time and add real value to your home. Call us for all of your Ottawa floor installation and refinishing needs.